Have you ever wondered about the files that Windows is holding in memory? I'm not talking about the processes or applications, but the actual files that are in computer memory. 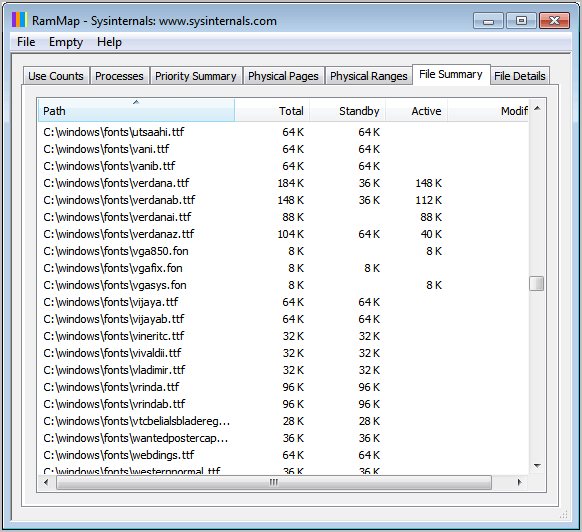 This includes the list of system fonts that are loaded in memory, the dynamic link libraries or the system drivers. Why can a file listing like this be helpful? You could for instance use it to determine if certain files or programs use up a lot of memory when they are running. You could find system drivers or fonts that you do not need to see how much space in RAM they use. Could also be very helpful for software developers who need to analyze their program's memory usage. Oh wow, handy. Good for those who don’t have anything above 3.7 GBs. Gonna be using this for sure. Also, you could uninstall some of those fonts from windows and use them with Nexusfont instead to free up some. ;) Is a nice on-demand only font tool that even works with Paint.NET (awfully exciting for me). Sounds great, will try it out. Damn, strike that. Didn’t read and see it wasn’t for XP, go figure heh. Awesome app, but anyone know a alternative for Windows XP ? Thank. Cool fine. Comes in handy when I’m trying to see if there’s a lurker on the system. Thanks.